Pilot Information Systems use the latest LED technology to display signals by means of colours and symbols to inform the pilot that it is safe to undertake take-off or landing operations. These systems can be controlled from the Flight Deck Office. The PILOT INFORMATION DISPLAY System is a tri-colour light system, used to inform the Pilot through colours and symbols that it is safe for him to undertake his take-off or landing. The use of LED technology contributes to greater light output, improved reliability and enables different shapes to be displayed. The unit can also be used in a Wave Off Light capacity with the red LEDs being set to flash in wave off situations. 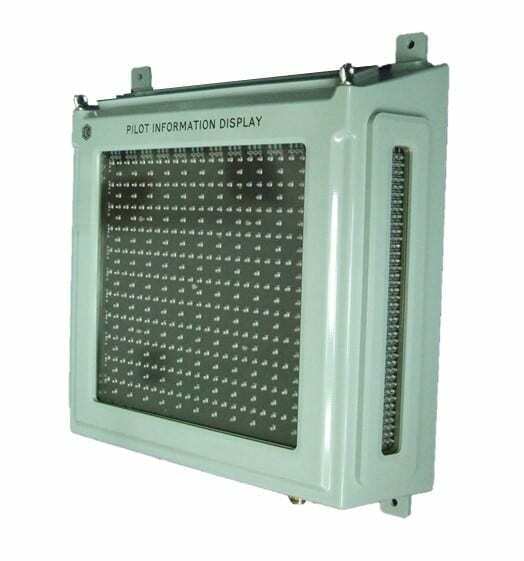 The PILOT INFORMATION LIGHT System is a tri-colour traffic light system, used to inform the Pilot that it is safe for him to undertake his take-off or landing. The use of LED technology contributes to greater light output, improved reliability and enables different shapes to be displayed. The DECK STATUS LIGHT (STOP GO) will comprise a fabricated aluminium housing, with optional lens hoods, and red and green NVIS LED light sources.